Cancer Council WA has more than $100,000 to help support the 12,000 Western Australians diagnosed with cancer each year thanks to this year’s Dig Deep fundraising campaign. 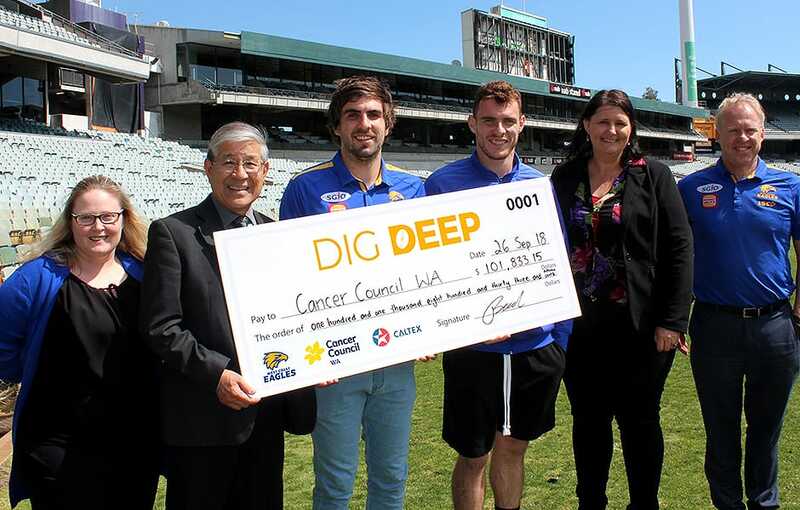 West Coast Eagles chief operating officer Richard Godfrey and Dig Deep player ambassadors Luke Shuey and Andrew Gaff were rapt to hand over a sizable cheque to Cancer Council WA board member Professor George Yeoh recently. The successful annual campaign, which has been running for the past 14 years, has now raised more than $1.5 million dollars. This grand total would not be possible without the help of our proud sponsor Caltex and our loyal West Coast Eagles supporters, who purchased dig deep merchandise in Caltex stores and during our derby battle with Fremantle on August 5 and got bidding in the Dirty Boots online auction after the match. Caltex regional manager Deborah Ruka and support coordinator consumer sales Jo Roguszka also helped hand over the oversized cheque to Cancer Council WA after another successful Dig Deep campaign in partnership with the West Coast Eagles. Cancer Council WA chief executive Ashley Reid acknowledged the generosity of the WA community and the support of crucial partners the West Coast Eagles, Caltex and Seven West Media. “Over the years the Dig Deep Campaign has enabled us to make substantial investments into world-class local cancer research,” Reid said. Cancer Council WA Ambassador Luke Shuey thanked the blue and gold army for continuing to support the Dig Deep campaign.